Food, Innovation, Quality is what the acronym stands for. Interesting concept of serving fine dining food in a casual environment. 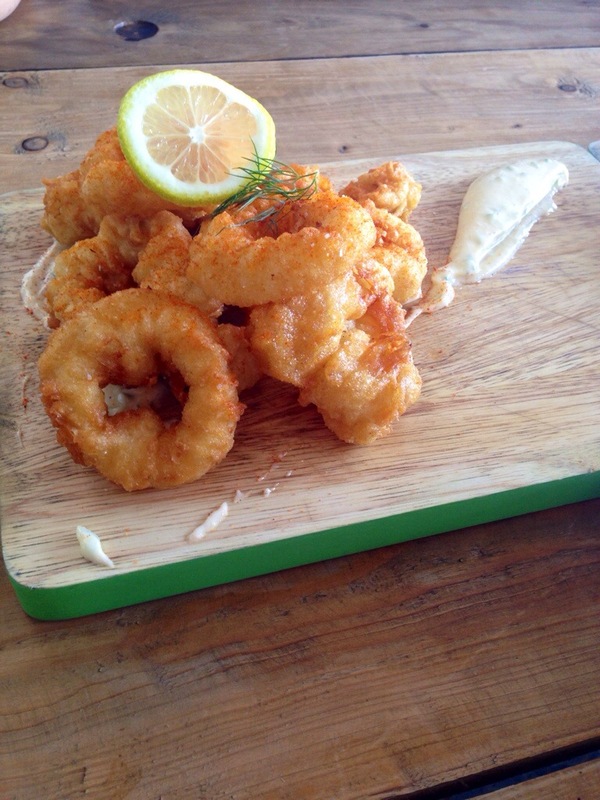 Opened in February, F.I.Q’s is in an unfamiliar area of Subang that my dad was so amaze we found it. Ample parking space all around. As you walk in, it has this industrial decor – red bricks, white walls with ageing wood benches, chairs and tables and colourful cushions. They had an open kitchen, with half brick wall separating the kitchen and the dining area. Still warm and cozy and customers can witness the chefs hard at work preparing the dishes. The menu is very ambitious to say the least. Looking at it, seems like they promise to serve you food with new interesting combination of flavours that you would only expect to get in a fine dining restaurant. But can they deliver? Lets jump to the food review! 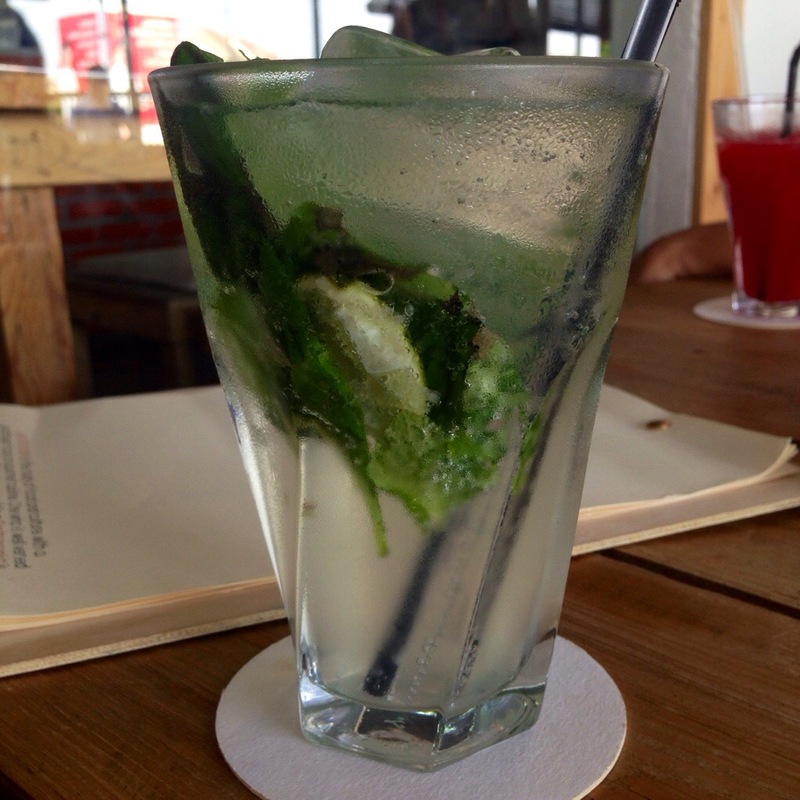 First, to drink, I ordered the mocktail F.I.Q’s Mojito made with mint leaves, sweet basil, sugar, lime and Sprite. As you can imagine, it was OVERLY SWEET! Why add sugar when you use Sprite? Sprite is sweet enough. It could also do with more mint. I ordered a glass of water and gave the Mojito to my sister. For our appetisers we had the Roasted Gnocchi which was served with crispy mushrooms, capers raisin emulsion, herbs walnuts and powdered olive oil. Straight away Heston Blumenthal came to mind. 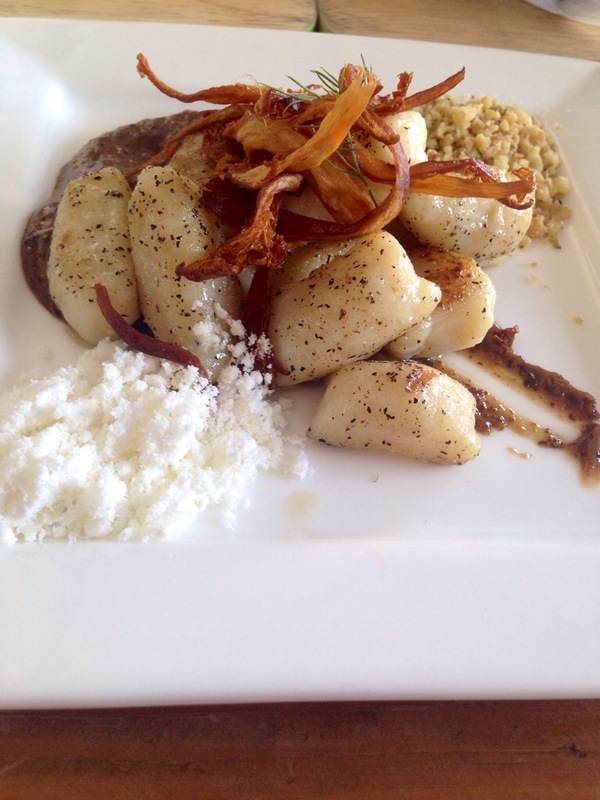 The gnocchi was fluffy but dense in the best way. So smooth it melts in your mouth but still have a bite to it. You can taste that it was probably made with 90% rich buttery mashed potato instead of having loads of flour in the mixture. The capers raisin emulsion was interestingly good. It had a rich flavour to compliment the gnocchi. Mix everything on the plate together and you get an explosion of flavours with different textures to stimulate your appetite. Mac & Cheese was listed under their starters menu which was a bit of a surprise but it did state that it was “light”. Creamy cheese sauce which wasn’t too heavy which is why they said it was “light”, chewy macaroni and crunchy beef bacon. Do I have to say more? 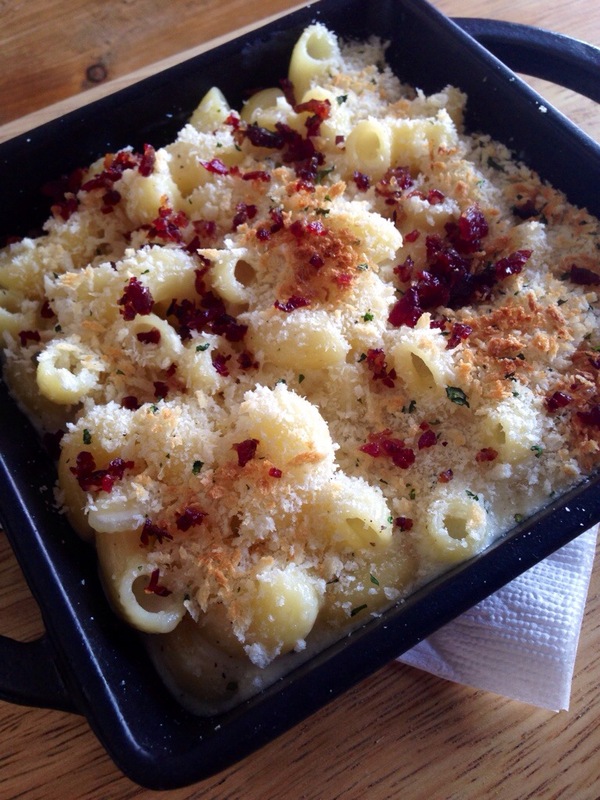 It was nicely baked with a generous sprinkle of Parmesan cheese on top to add to the crunch. It was definitely light enough to be a starter. Thumbs up to that! 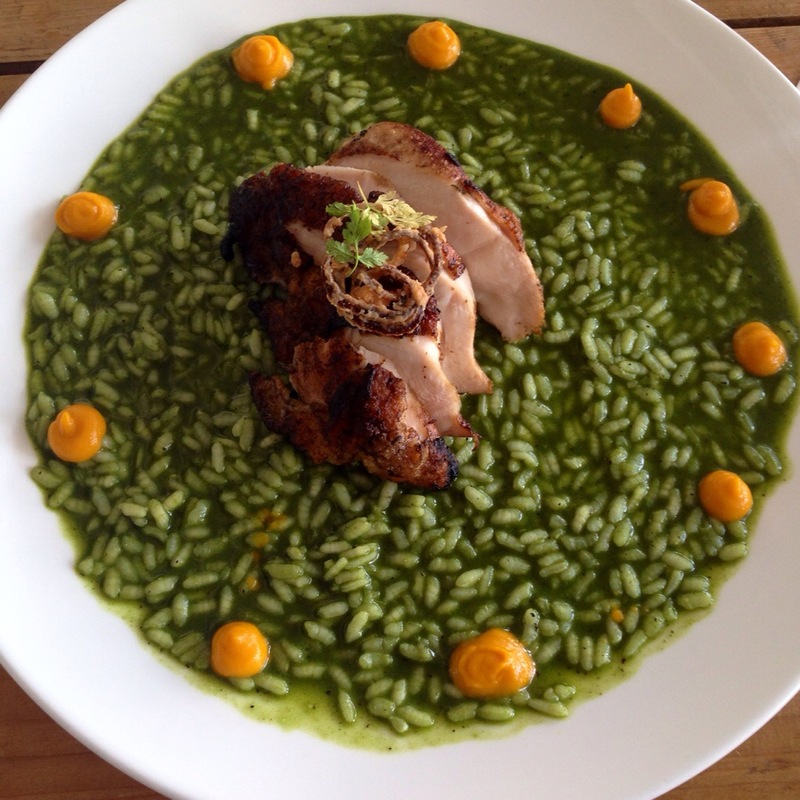 As for main course, my Spinach Risotto served with pan fried chicken breast, carrot puree and fried onions failed to impress. When I ordered risotto, I was expecting a rich creamy dish with almost a porridge- like consistency yet each grain still holds its shape and texture. Instead, I got an undercook risotto that was too salty to even consume – bare in mind I like my salt. I couldn’t take another mouthful so I returned the dish and politely asked if they can prepare me another one minus the extra salt. About 10 minutes later, came out my new risotto. Lets give it another go. It was still a tad undercook, not as bad as the first one, and it was still salty but edible. It was not creamy and it didn’t have that porridge-like consistency that I was looking for. The carrot puree helped to sweetened the dish and reduced the saltiness. The pan fried chicken breast was actually delightful. It was crunchy on the outside but manage to keep its moist on the inside. As usual, I had a taste of everyone’s food. Sharing is caring! 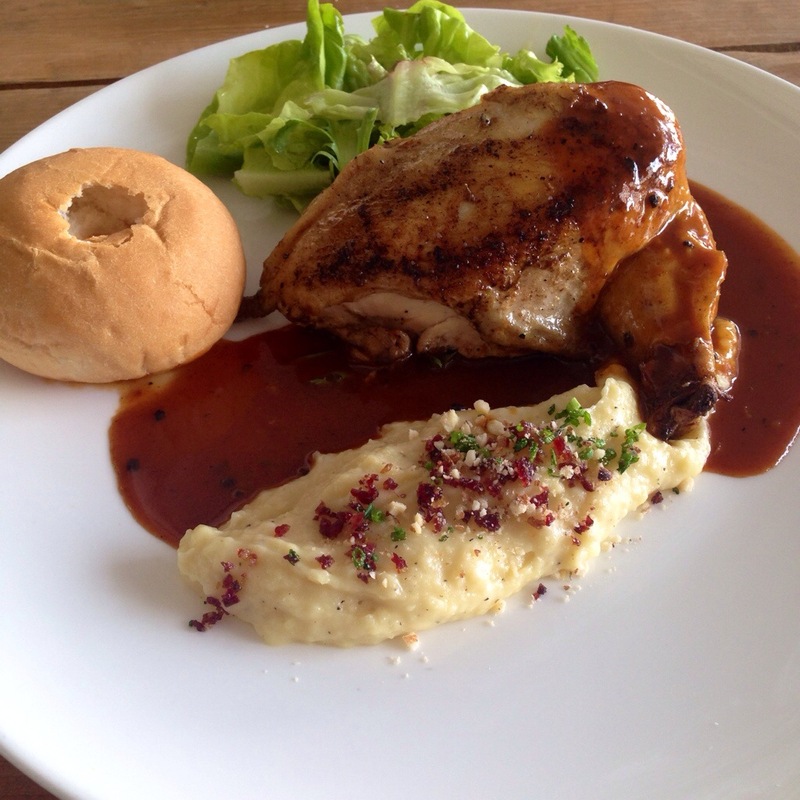 My sister ordered the Roasted Chicken served with loaded mash potato with bacon bits, chives and almond, mix greens (which was just lettuce), roasted mesquite gravy and soft rolls that they made themselves. Loaded mash potato was not that loaded. It was just a spoonful of potato puree and it was smooth and creamy with crispy bacon and almond to add a bite to it. The chicken was probably a minute overcook. It was still moist but you can tell that if it stayed in the oven a second longer, it would’ve been dry. The gravy tasted like your usual roast gravy with a touch of barbecue sauce. They proudly advertise that they make their own bread and the bun was in fact soft and fluffy but we didn’t see the point of it being apart of the dish. I managed to convinced my mum to order the Salted Beef Fettuccine. I must compliment the chef on the pasta as it was made and cooked to perfection. Oh did I mention that they try to use all fresh ingredients and that they make their own pasta too? Yes! Handmade pasta has to be the best thing ever and it was! it was really good. 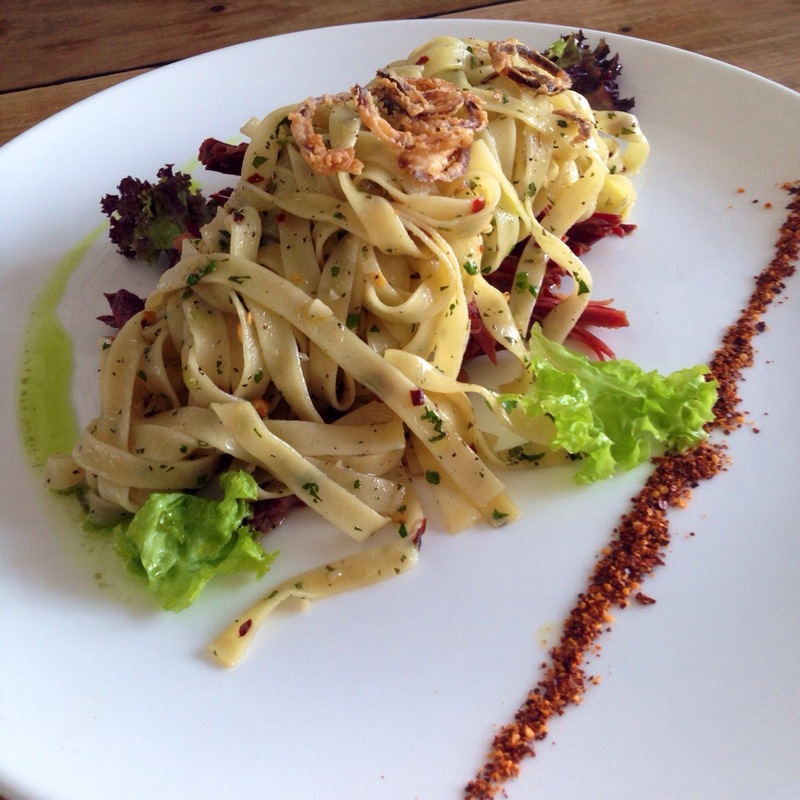 The fettuccine was cooked with basil oil, tri herbs and chilli flakes served on a bed of 150 gram of beef brisket. All of the flavours complimented each other well. The pasta balanced the saltiness of the beef and the chilli flakes added heat to the dish. 150 grams of beef was a tad much for the tiny amount of fettuccine it came with. Ended up having to eat the salted beef by itself and it was well, salty! Pan Fried Seabass served with chinese kale, miso carrot emulsion, maldon sea salt and apple raita was Dad’s choice of main course. You can taste the freshness of the fish and it was cooked perfectly as the fish flaked off from the crispy skin beautifully. 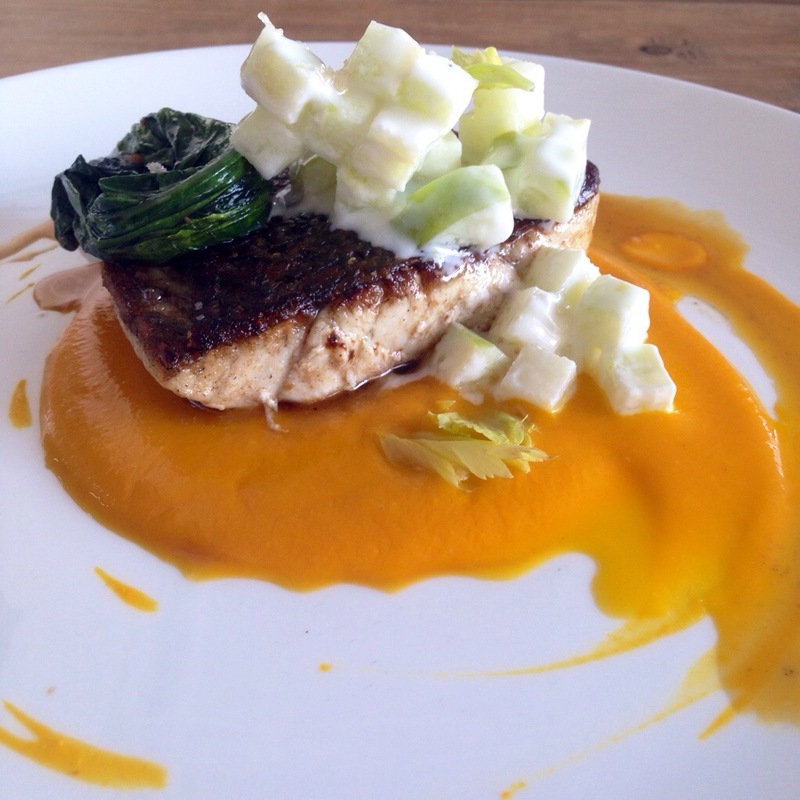 The miso carrot emulsion didn’t go well with the fish, it didn’t enhanced the flavour of the fish in any way. The tartness and sweetness of the green apple cubes coated in yogurt was an added crunch to the dish. It was a good dish according to dad as he cleans his plate but I must say when he fed me the greens on the dish, salt overdose took over the chinese kale. The fish was a pretty thin slice and it was small too. Didn’t fill up the big guy at all. I was beyond disappointed when the lovely waiter told me they don’t have the Baked Alaska that I was excited to devour. So we ordered the Smores instead. 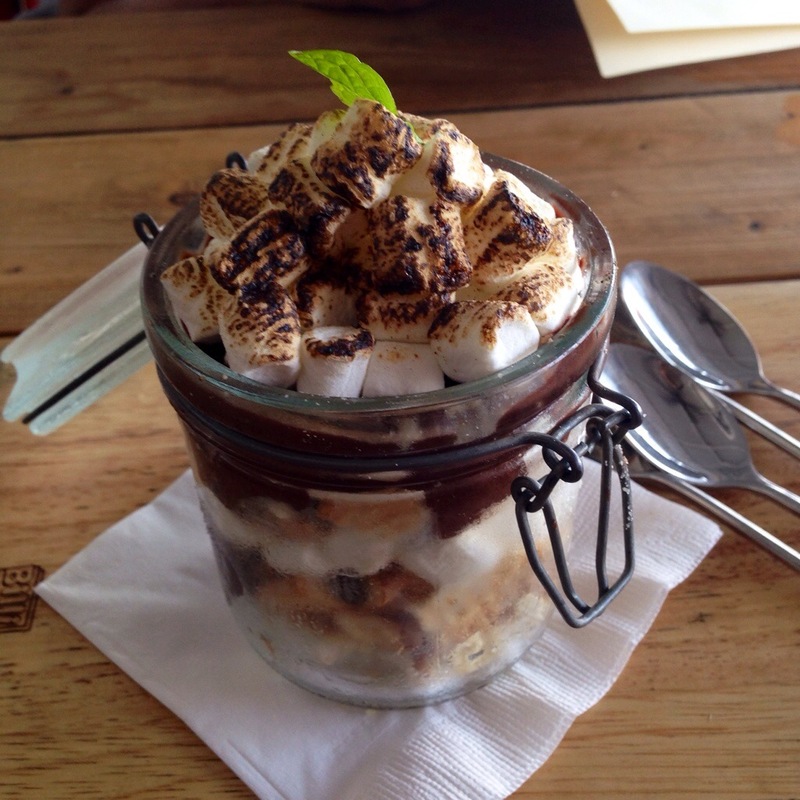 the Smores came in a jar with the crackers at the bottom, followed by marshmallows on top, then chocolate ganache and more marshmallows at the very top. It looked amazing. But it was so difficult to reach the crackers at the bottom without making a complete mess. Chocolate ganache was too thick but it didn’t taste too chocolaty which I like. The tiny marshmallows were probably just quickly blow torched so it didn’t melt on the inside. Disappointed yet again! All and all they have a good concept to start with but there are still rooms for improvement. I am pretty sure they are working on their menu still and are planning to bring out more exciting experimental flavours for us. 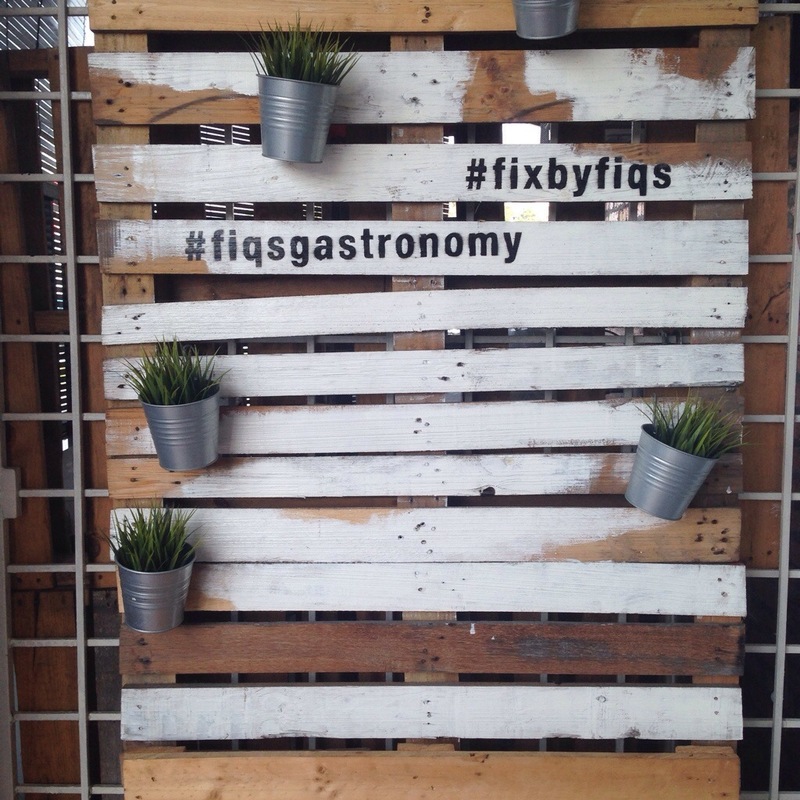 So will I come again to F.I.Q’s Gastronomy? Yes I definitely would give it another go. There’s a lot on their menu I would like to try. Have you been to F.I.Q’s?